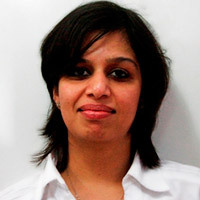 Amita Malhotra is Director at Blogworks, a leading digital strategy consulting firm. With ten years of experience in marketing and communication strategy, Amita, led the knowledge & thought leadership mandate for the firm, strategizing and executing some of the earliest reports, case study initiatives and events to document the use of social and digital media marketing in India. She has led a variety of programmes from corporate branding initiatives Mahindra’s ‘Rise’ vision, to employee engagement progammes for GE Capital. She has facilitated several client workshops and spoken at forums such as Globalocal by the German Book Office, Sankalp Forum by Intellcap and TERI’s Future Leaders Cafe. She has taught as a guest faculty at the 9.9 School of Communication. She completed her Bachelor’s in English Literature at Lady Shri Ram College (LSR) and undertook her Masters in Communication Management from the Symbiosis Institute of Mass Communication, Pune.